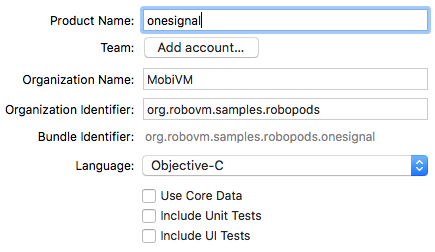 Long answer: Any RoboVM binary (app, app-extensions, framework etc) will include RoboVM runtime and everything that comes together. This means that both app and extension will be quite big. More over it is not clear enough if it is possible to run two instances of VM. In theory to do this app has to be organized as Embedded framework. Application and app-extensions shall be native wrapper that use this framework. Not good idea. select OneSignal folder in project tree and hit ‘delete’. Select move to trash. Configure target’s settings General-signing with any certificate and provisioning profile that matches extension bundle id (wildcard provisioning profile rules here) or just create and setup dummy certificate/profile for signing. In general signature doesn’t matter here as when included to RoboVM project app extension will be resigned. It is only required to build binary with xcodebuild. 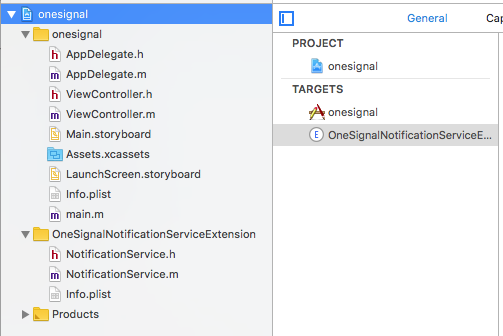 codesign -f -s - "OneSignalNotificationServiceExtension.appex"
<appExtensions>, type <extension>: list extensions to include in app. wildcard id (e.g. * ) which is preferable way as it allows to have one profile for many extensions.